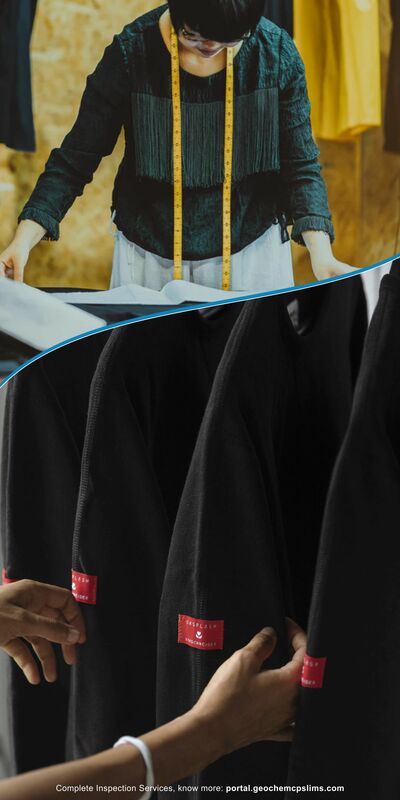 Geo Chem’s complete inspection services regarding textile and apparel assist in delivering top-most quality of products to market it with agility and precision. We can analyse defects and whether compliance is meet during entire stages of production. We provide the following inspections to evaluate pre, post and during inspection of the product. Before mass production, usually there is no finished product from mass production in factory. We will check raw material for quantity and functional quality, do Identification of material. If any semi-finished product or finished product is available, we may check their quality by sampling. When 10% - 20% of the goods had been checked and packed, or the percentage specified by the applicant. It shall find out defects in the earliest stages. Check semi-finished goods on every production processes (production status) and the key production processes shall be displayed on report by means of photos, if necessary. Record the size or color, which will not be available for inspection. The inspection is done when at least 80% of the lot had been packed into export carton and the rest 20% shall also finish production and ready for sampling. Check the finished goods (Packed and unpacked) in proportional to assortment of styles, colors, sizes, etc. Check before it is delivered to the applicant. Besides product workmanship check, also check PO, style, color, measurement, bar-code/assortment/labelling check, packaging and shipping mark and other specified by the applicant. Loading Supervision & Container stuffing supervision. Exact loading time is very important. The loading time for 1 container is usually within 3 hours. Witness the sealing of container. Photos are taken for reference. Record and take photo on the container (and truck if available), information of container number and license board should be legible. Check the factory’s submitted packing list to see if the loaded quantity complied with ordered from applicant’s description, etc. The correct shipping mark / form of packing / carton size of goods to be loaded, etc. Randomly draw and open several shipping package units to check the packing of goods including quantity, marking, assortment, etc., and take photo. Actual finding will be recorded on the Provisional Inspection Report. Count the quantity of goods and record the condition of outer packaging (master cartons / pallets) to see any wet or damage. Close monitor and control the shipping packaging units at ANY TIME of loading process, to make sure we always know the number of shipping packaging units inside shipping container at any time of whole loading process. Record loading status or loaded quantity by writing or photos. If the loading process needs pause due to uncertain reason, the inspector should work with factory and driver to find a method to seal the shipping container temporarily, e.g. we may use our additional plastic sealer to lock the door and tell other parties do not open it, after we return, we can cut it and continue the loading. Check against the quantity after all goods are put into the container whether it is complied with ordered / packing list or not. Compared our result with the contact person or factory representative. If there is any deviation, unload and then reload the goods. To evaluation factory capacity, capabilities & quality management system before starting production activities of new suppliers. This process will determine adopted quality level standard followed by supplier. This process may consist of following parameters.